Participants: Michael, Kate, Shin, Akie, Sumiko, Yuu, Sanae. 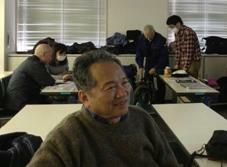 Class was a lecture of preposition by Masanori Tatsui. It was continued from last week. And English song of this week is a request of Shin – “End of the Road” _ Boyz II Men. One by one we spoke about book or music. Kate was brought two sticks (Photo). 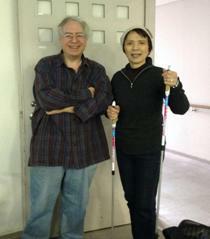 She is learning to Nordic Walking. She spoke long time about a book “あきらめる健康法” in Japanese. Shin spoke about Buddhism. Akie spoke about “Wuthering Heights” of Kate Bush, and she sang that song. 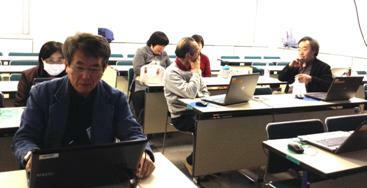 Today’s teachers: Douglas, Akiyuki, Kim, Takuya. Participants: Michael, Kate, Makkun, Akie, Yoshikazu, Hideo, Sumiko, Mieko, Walt.